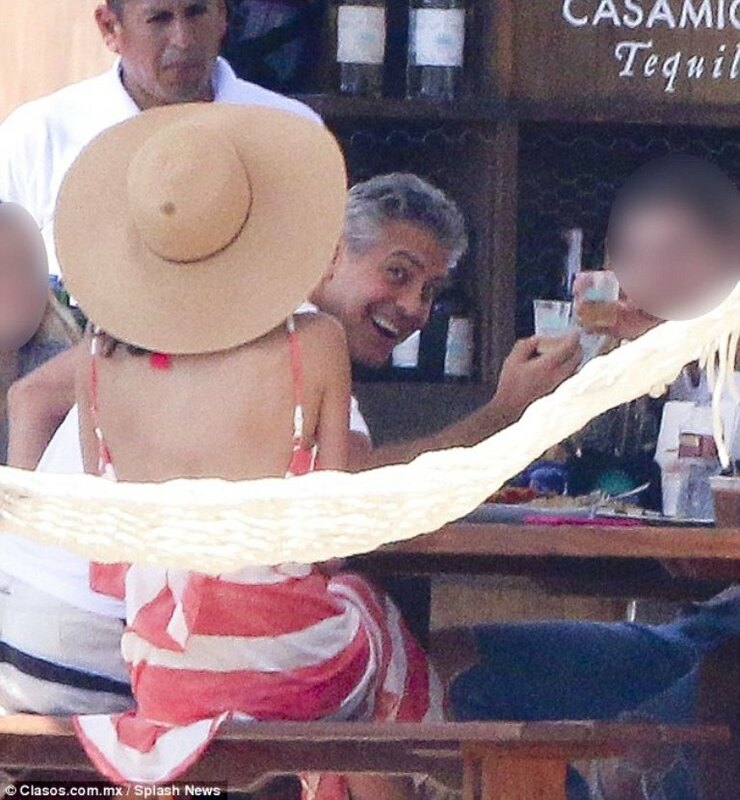 Amal and George Clooney were spotted in El Dorardo Beach club in Los Cabos, which is located at the southern tip of Mexico’s Baja California Peninsula, with Rande Geber and Cindy Crawford and their children. Amal Clooney looked stylish in a red and white striped maxi dress, which she paired with a straw hat and her Prada sunglasses. Her nails are red. 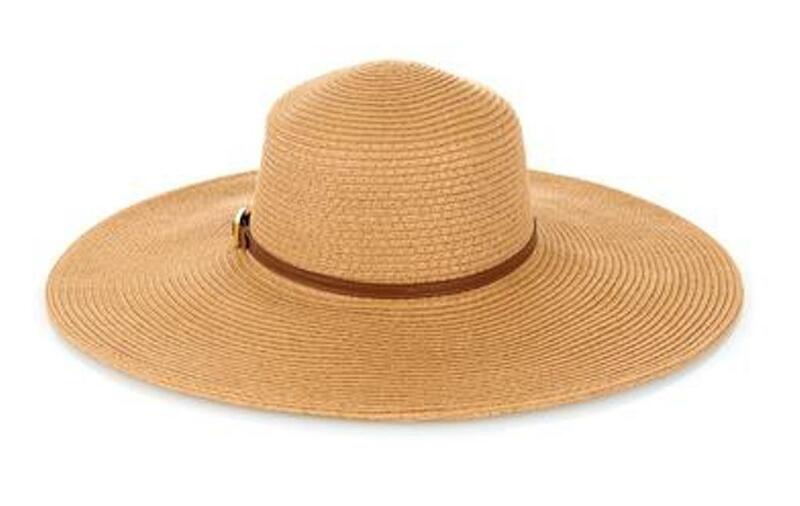 Concerning the floppy hat (the pics are so blurry …). 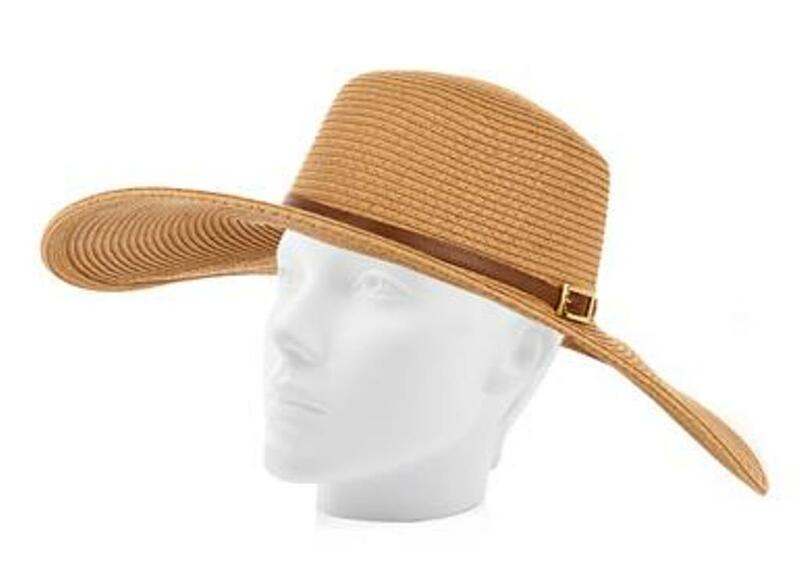 I hesitated between raffia and felt and it is raffia. 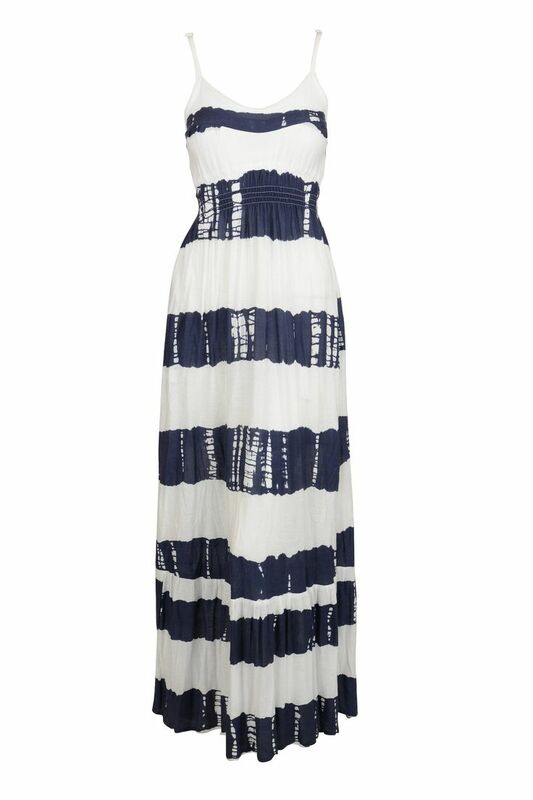 With thanks to Reem and her comment, we have an ID for the Amal’s striped dress. The dress is by Letarte beachwear from the tie dye collection. I do not enjoy looking at these recent holiday photos. I can see how unhappy George is as he can see the paparazzi photographer on all the recent ones. They should be allowed privacy whilst on a holiday not being watched like this. I would hate it on my holiday trying to be free in a bikini and being photographed ready for a journalist to put their angle on it. Amal is clearly mindful too and recently had her back to all the photos. She isn’t even wearing a bikini and I wonder why? Because a photographer is putting the bikini photos on a website perhaps? 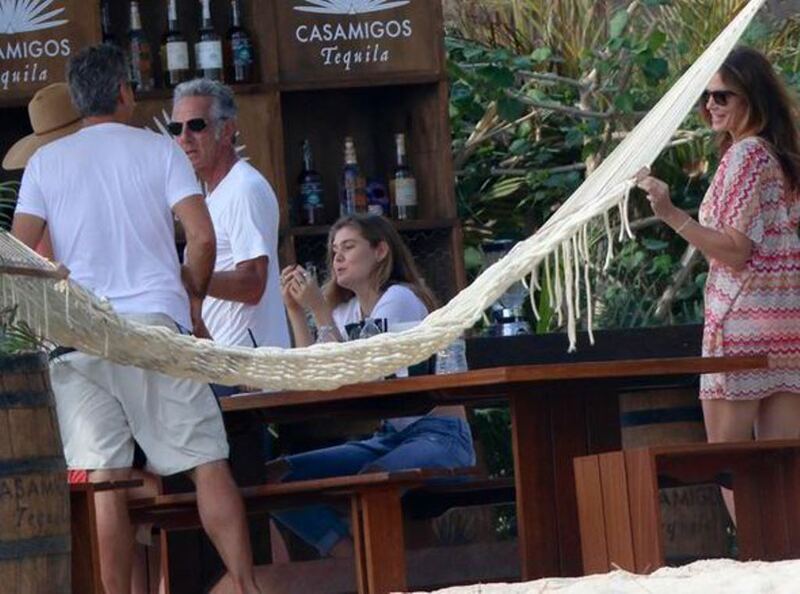 George and Amal and Cindy Crawford’s husband all looked really unhappy on their holiday, because of this photographer. 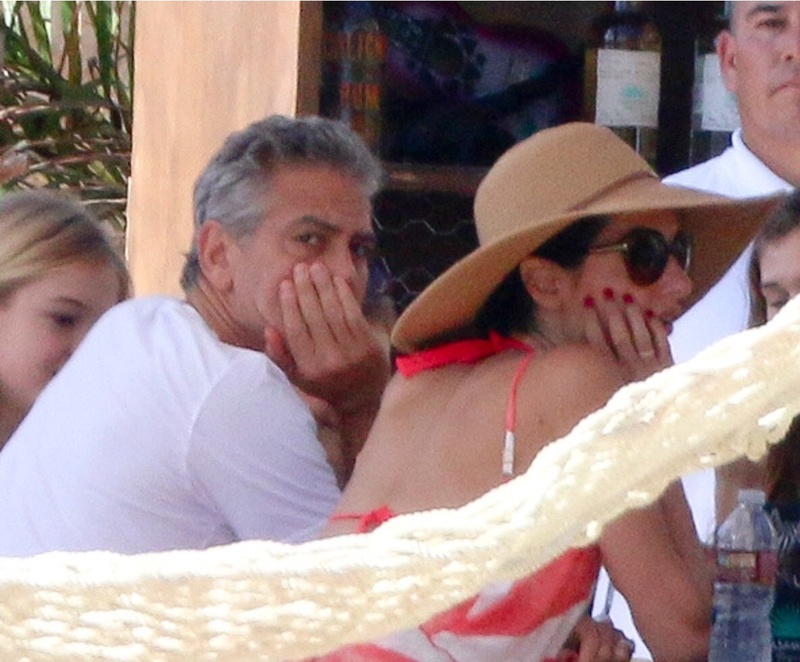 Please rethink about whether it’s wise to post these holiday photos if you’re a true fan of Amal. They haven’t bought me any joy but just sorrow for their unhappiness that we are contributing to it, by looking at these new private holiday photos. I’m a former national TV news journalist, and I don’t agree with this, it’s a step too far as a fan of Amal’s. George and Amal and the rest know they will be photographed in this particular spot. They only go there once in a while. We never see other pictures of them on vacation here. This is where the press can get access. If they were so unhappy about being photographed they would not have gone to this spot. But please , they want to be photoghaphed !!! All these photos are equal only one spot for ther brand of ” casamigos tequila” even a two old child would understand !!! There brand logos in any photo. This and’ a spot …………. George certainly does not look unhappy!